Every morning, as I sit on my porch drinking coffee, I look out toward the Rockport harbor to check the current status of a sinking ship named, of all things, "Resilience." It seems every day the stern slips just a little more into the dark water below, its slow descent seeming to defy its name. But then, this former U.S. Navy minesweeper seems to have nine lives. 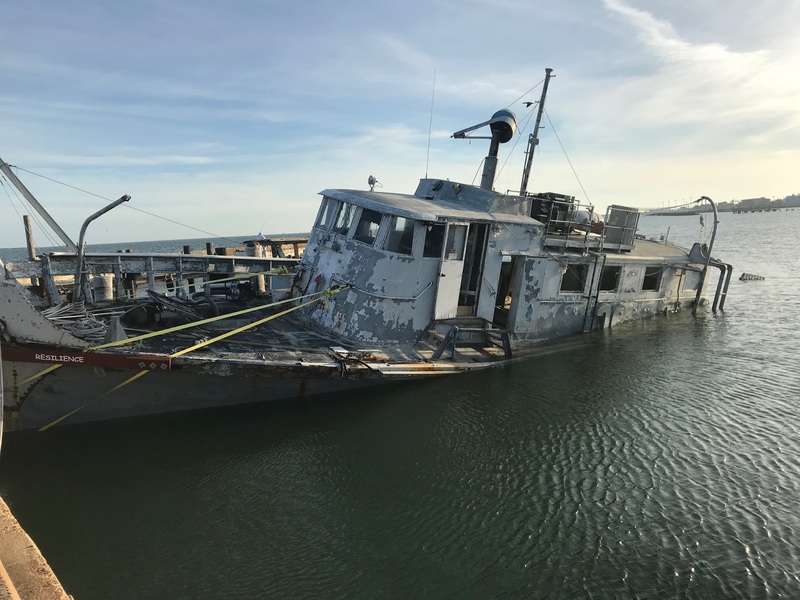 Its owners were in the process of having it towed to dry dock to turn it into a soup kitchen for homeless veterans when Hurricane Harvey interrupted those plans. Resilience slipping into the dark water below. Signs of the owner's optimism - a new board with a reminder of the boat's name. 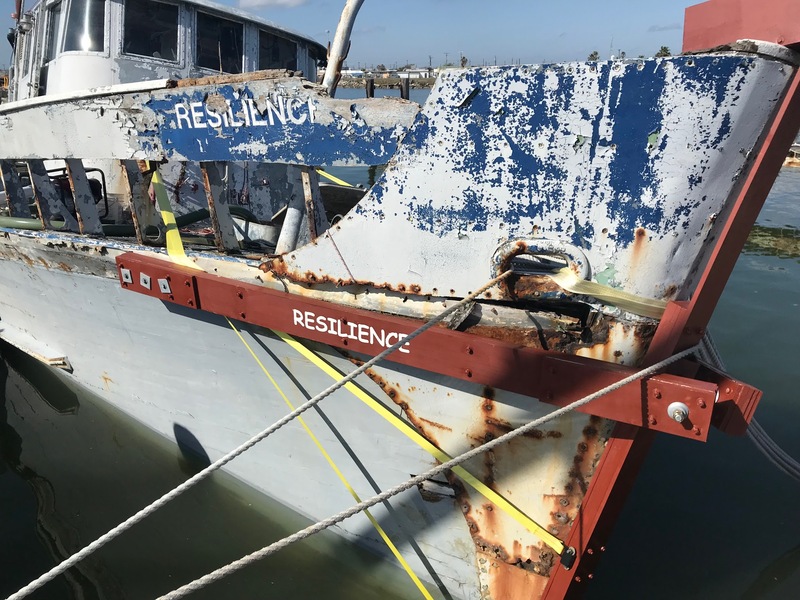 It's hard not to connect the boat's name "Resilience" with what I see all around me in Rockport. Everywhere I look, people, businesses, and homes seem to have their own stories of resilience from this storm that has so devastated this sleepy little town. We all have our stories - either of having "dodged a bullet" or of having our world totally devastated. As I type these words there are maybe six people outside hammering, cutting, and working to bring our property back to where it was before Harvey made his appearance here. Progress. Sometimes painfully slow, but it is still progress. And as always, I am keenly aware of friends who are still waiting for those workers to appear, or who have given up and moved away. And every day I have conversations with friends, some who are business owners, still struggling to maintain their own version of resilience, instead of slipping into hopelessness and despair. So, what is the secret to moving toward resilience instead of despair? Sometimes I think it has more to do with habit than anything else. We all know or have heard of people who lose everything and yet still seem to maintain an attitude of gratitude. Certainly gratitude is an important component - finding those things we still have to be grateful for. And noticing those things and feeling gratitude for them is a habit we can cultivate. If, instead, we find ourselves stuck blaming others for our misfortune, we no longer are in charge of our recovery. We have given up our power to reclaim our own destiny. So, noticing the messages we say inside our head and deciding whether they are moving us toward recovery or toward sinking like the boat "Resilience" is a step in the right direction. I find myself alternating between feeling that sense of despair and remembering how much I have to be grateful for. I just wish I had a little more patience, since recovery is not always fast. And I do believe there are many things that are going to be better because of Harvey. It just may take some time before they are visible to us. Piles of this new "sand?" are appearing all around the beach park. All these palapas need now are people to enjoy them. As I biked around the beach park this morning I could see signs of that re-emergence all around me. 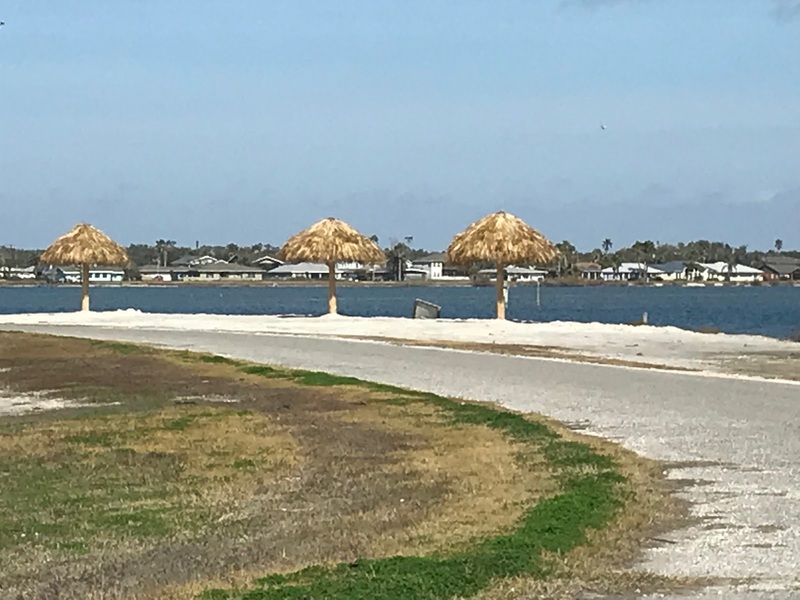 The beach is getting re-nourished, the palapas have been replaced, and the birds seem to be reminding us of the re-birth that comes with the changing seasons. The metal building attached to our house that is going to house Stan's studio is certainly better than it was pre-hurricane - thanks to a new skin and roof that had to be replaced thanks to the storm. The beauty shop next to us has come back better than before, the Daily Grind has a new roof, and our commercial tenant has a new awning thanks to Harvey. "Southern Rayne" back better than before. "The Strand" beauty salon has had a major facelift. The "Daily Grind" is getting there - they now have a new roof and are working on the inside. As for the boat Resilience, when I see it looking so defeated and slipping further each day into the water, it's hard to imagine it making a comeback. A peak at a Facebook page dedicated to the former minesweeper, however, reveals an optimism by its owner that it will recover. 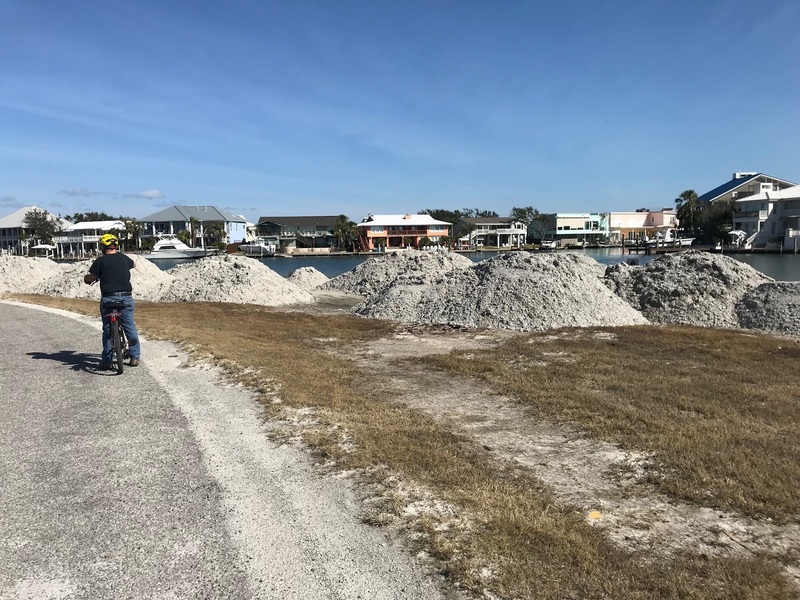 So surely if he can hang onto that sense of optimism for a boat that is halfway under water, I can maintain that same optimism for the future of Rockport post-hurricane. I didn't say it was always easy to do, but it sure beats the alternative. 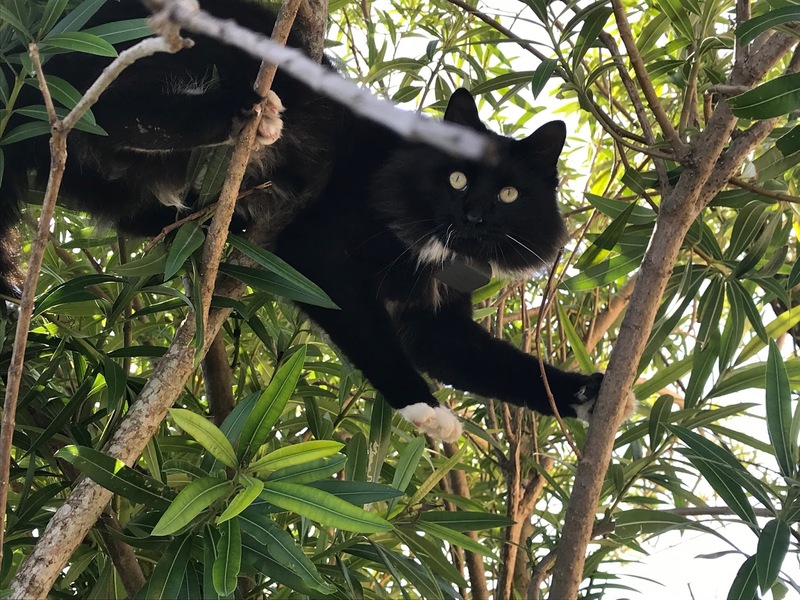 Even Skipper seems optimistic as he embarks on yet another daring jump, assuming apparently that if he falls, he will survive. So will we.